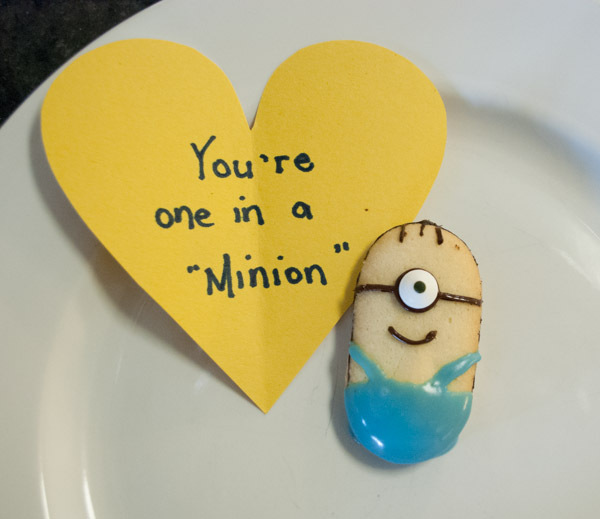 Who doesn’t love the cute little Minions from Despicable Me? Here’s a Valentine idea suitable for girls and boys of all ages. 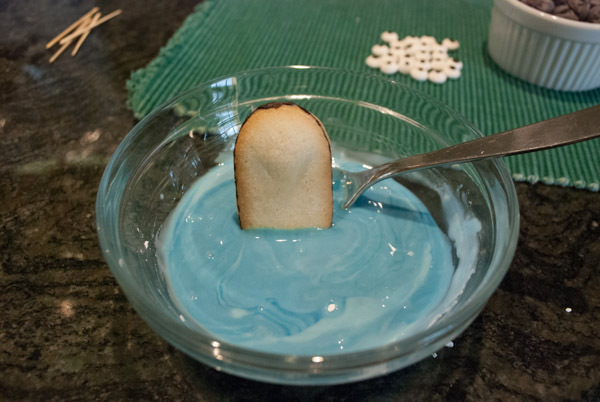 Prepare the blue icing (see below). Prepare the melted chocolate (see below). 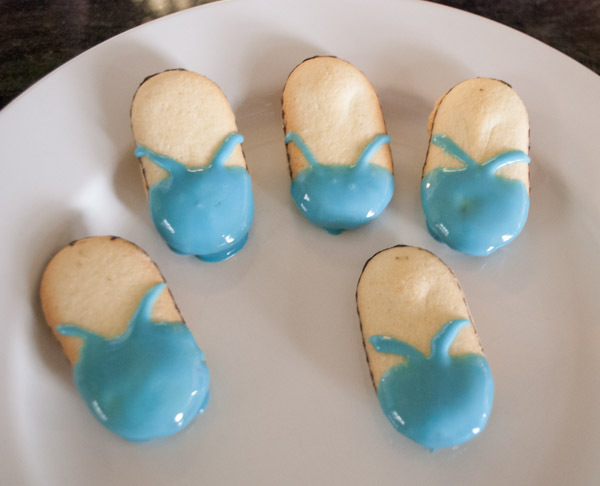 Dunk a Milano cookie in the blue frosting, covering the bottom third or fourth of the cookie. Using a toothpick or knife, drag frosting to each side to create the overall straps. Cut a very small piece off the corner of the bag of chocolate. Pipe the melted chocolate across the Minion to make goggle straps. Add a dab of melted chocolate in the center for one eye (two dabs if making two eyes). Pipe some frosting on top if you want to add hair. 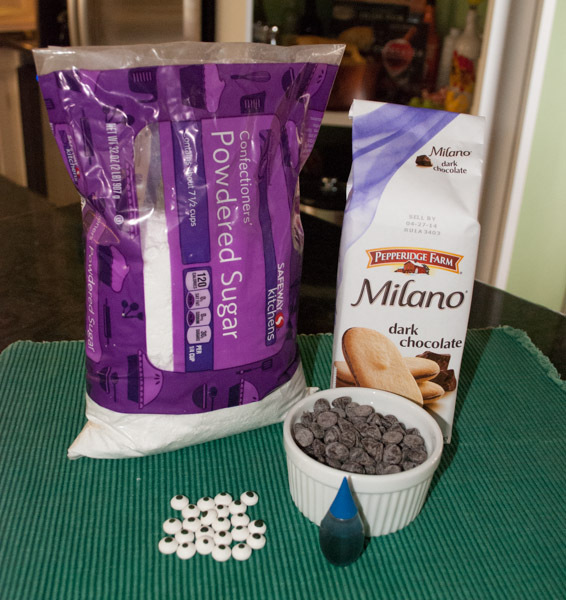 Place about ½ cup of chocolate chips in a microwave-safe bowl. Microwave for 30 seconds, remove and gently stir. Continue microwaving for 30 seconds at a time until melted. Spoon the melted chocolate into a small Ziploc bag. We found it looked better if we made a hearty dab of chocolate to hold each eye, so that the eye would squish some of the chocolate out around the edge. It makes the eyes look more like it was a goggle. You can send these to school on a plate or wait until the chocolate hardens and slip each one in a bag. We found the candy eyes for sale at Target, Ben Franklin and Safeway stores. Thanks to instructables.com for the idea! 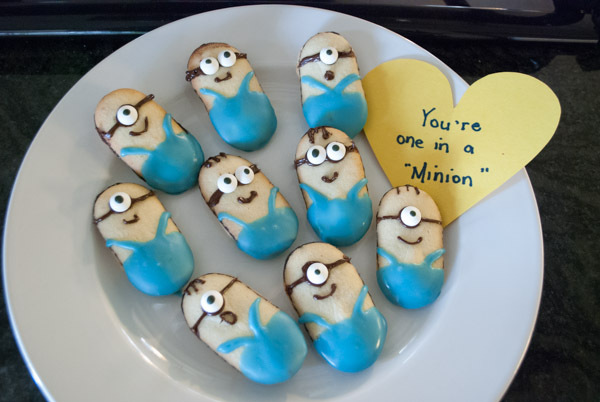 This entry was posted on February 4, 2014 by mdaucello in Recipes, Valentines and tagged cookie, DIY, Milano, minion, Valentine.